This early low-budget Steve McQuen WWII drama is directed by Don Siegel - the no-nonsense action director responsible for the legendary 1956 version of Invasion of the Body Snatchers, as well as many Clint Eastwood films; including Dirty Harry. McQueen's co-stars here are a non-singing Bobby Darin; Fess Parker (better known for his never-challenged role as Davy Crocket in several Disney productions); and a young bespectacled James Coburn - who had already appeared on the screen alongside McQueen in The Magnificent Seven, and Great Escape; and, believe it or not, Bob Newhart - in his first movie role! But top acting honours here must definitely go to relatively unknown Joseph Hoover, for his all-too-small part as tough-as-nails army officer, Captain Loomis. 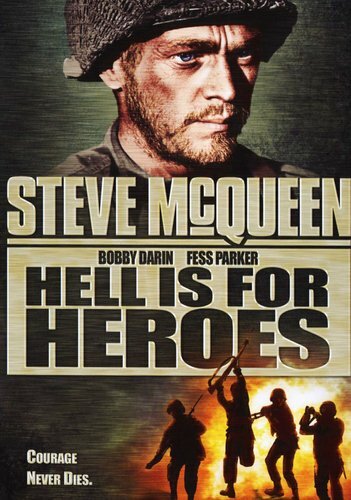 Once a sergeant, Private John Reece (Steve McQueen) is a deteched and troubled loner who manages to alienate himself from the rest of 2nd Squad right from the start. 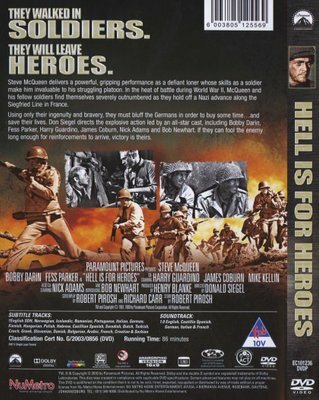 When the men mistakenly believe that they're being sent back down the line for a well-deserved rest, the company commander, Captain Loomis (Joseph Hoover), is worried because Reese goes crazy when there is no fighting, but Sergeant Pike (Fess Parker) who apparently knows him of old, comments that he is a good soldier in combat. Other members of 2nd Squad include con-man/thief Corby; the "mechanic-who-can-fix-anything" Henshaw; the easy-going, somewhat-naive kid, Cumberly; Polish refugee Homer; and family man Kolinsky, The morning after they arrive at their appointed post and dig in, the men realize they are spread so thin that any reconnaissance by the Germans will quickly reveal how weak the American defenses are. Awaiting reinforcements, they are unexpectedly joined by Driscoll - a company orderly clerk who has lost his way and knows nothing whatsoever about soldiering!